Rebuild chimney is necessary when problems become noticeable and it is too late for simple repairs. When significant chimney problems appear, the best solution is often tearing down the chimney and rebuilding. Maintaining your fireplace and chimney can preserve the value of your home and prevent fires or other malfunctions. Call the chimney rebuilding experts at 1-877-952-7425 for immediate service or submit a Free Chimney Rebuild Estimate. A chimney's life span depends on several factors: climate, usage, construction. Natural factors like storms, freeze and thaw cycles, and heat exposure contribute to the deterioration of a chimney and eventually cracks start forming in the cement, bricks, and mortar. It is recommended to have your chimney rebuilt or maintained as necessary to avoid chimney hazards such as gas leaks, carbon monoxide poisoning, fire hazards, loose or falling bricks, and collapsing chimneys. 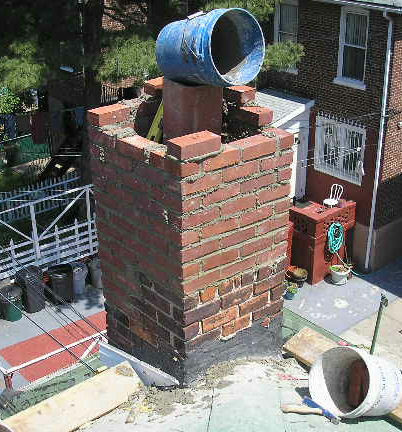 If your brick or stone masonry chimney is beyond simple repairs then call Chimney Repair NY today at 1-877-952-7425 or request a Free Rebuild Chimney Quote and we can rebuild it for you quickly and satisfactorily to ensure your chimney is in good condition and functioning normally. A well maintained chimney can make all the difference in the efficient performance of a fireplace and ensuring the safety for you and your family. We have been professionally rebuilding commercial and residential chimneys for over 20 years and we continue to provide premium service backed by our customer satisfaction guarantee. Contact the trusted chimney specialists at Chimney Repair NY 1-877-952-7425 today for comprehensive chimney services done properly with caution and safety in mind.